Tom Kenyon » Who Is Tom Kenyon? There are two items in this section that describe me and my work. One is language-based, and the other is a work of art. This language-based description was created by the publisher of Marquis Who’s Who in America, which was founded in 1899 by Albert Nelson Marquis to recognize leaders in their fields of expertise. I have been noted in the 66th – 71st Editions of of Who’s Who in America (2011-2018) for my work in the field of psycho-acoustics and sound healing. The Newsletter about me was created by their editorial team, and I think it describes my work, education and background quite well. You can view this document by clicking here. This work of art is an ink drawing that was created by the artist, Adriana y Martin, during a workshop in Seattle, Washington and was dated November 3, 2018. Adriana handed me the drawing as my wife, Judi, and I left the final session. In my opinion, his drawing accurately describes me and my work just as well as the language-based description. But this one has no words. It is mute but speaks with a visual eloquence. What strikes me about this drawing is that you can clearly see my physical form as well as some of the musical implements I use. But moving across the field of view are columns of energy that penetrate the seemingly solid objects on the stage including my body. 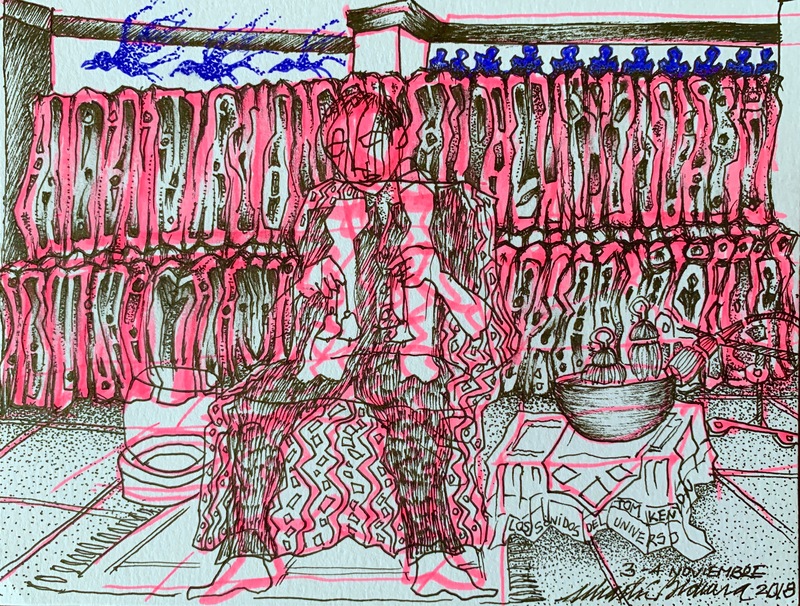 At the top right side of the drawing are figures of what I interpret as the spirits and energy beings who emanate benevolent energies during the Work. And on the left side at the top are some birds, which I presume relate to a Spirit-Singer I worked with in that Intensive by the name of Tazu-kan and whose power animal is the Condor. I think this image captures the enigmatic reality of my work, which sits at the intersection between our normal everyday world of perception and the fluid quantum worlds of non-ordinary realities—a realm some call Spirit or the Divine but which I simply refer to as The Great Mystery. Click here to view Momento Magico!! There is something symmetrically appealing to me in these two juxtaposed and very different descriptions. One of them is highly cognitive and the other highly intuitive. And this is, in a very real sense, the nexus of my work. I operate and teach from both the rational cognitive realms and the trans-rational intuitive realms of consciousness. I find that the intersection of these two ways of perceiving are not in conflict but are rather quite complimentary, and their unification holds a key to greater creativity, insight and wisdom. The physical roots of these two seemingly divergent ways of perceiving the world can be traced into the very structure of our brains. But I would suggest there is another ephemeral root as well, one which reaches beyond the constraints of our physical nervous system and our normal perceptions of time and space. It is unfettered and unbounded. And yet it does not conflict with the realities of our physical nervous systems anymore than Quantum Mechanics conflicts with Newtonian physics.